Signed, inscribed and dated: “Frank Wood 1908" (lower right) and "H.M.S. St. Jean D’Acre./Lisbon Feb 1861." (lower left) indicating having been executed in 1908 but depicting a scene in 1861. Condition: Apart from 2 small repaired spots of foxing and some slight overall acid discolouration to the sky, the picture appears to be in good overall condition. General Comments: Named for the great Syrian coastal fortress assaulted and captured by the Royal Navy in 1840, H.M.S. St. Jean D’Acre was originally ordered as a pure sailing ship in 1844 but never begun and cancelled the following year. Re-ordered with auxiliary steam power in February 1851, she was laid down at Devonport that June and launched in March 1853 at a cost of GBP107,561. A large two-decker measured at 3,253 tons, she was 238 feet long with a 55 1/2 foot beam and mounted 101 guns of varying caliber, notably 36-8in. muzzle loaders on her lower deck. Fitted with 600nph. Penn engines, she achieved just over 11 knots on her trials and became a highly regarded ship throughout her career. Initially attached to the ‘Western Squadron’, she then enjoyed the rare distinction of serving with both the Baltic and Black Sea fleets in 1855 during the two quite separate phases of the Crimean War. Her final overseas posting was to the Mediterranean Fleet (1859-61) and this painting depicts her last call when homeward bound in February 1861 under Captain Thompson. Thereafter paid off and laid up in reserve, she was sold to Castle’s ship breakers in 1875. Biography: Frank Watson Wood was born in 1862 in Berwick-on-Tweed. A painter of shipping he studied at The Berwick School of Art and in South Kensington & Paris. In 1886 he was appointed Second Master at Newcastle School of Art and during 1889-1899 he was Headmaster of White School of Art . 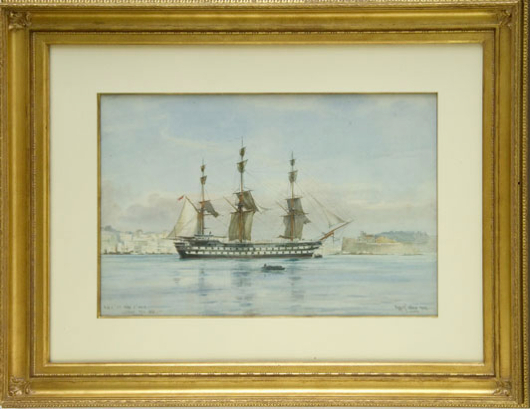 In 1900 he went to Portsmouth and painted naval subjects, accepting many commissions from naval officers for portraits of their ships and of naval exercises. Source: “Dictionary of Sea Painters” by E.H.H. Archibald (Antique Collectors Club Limited 1989).